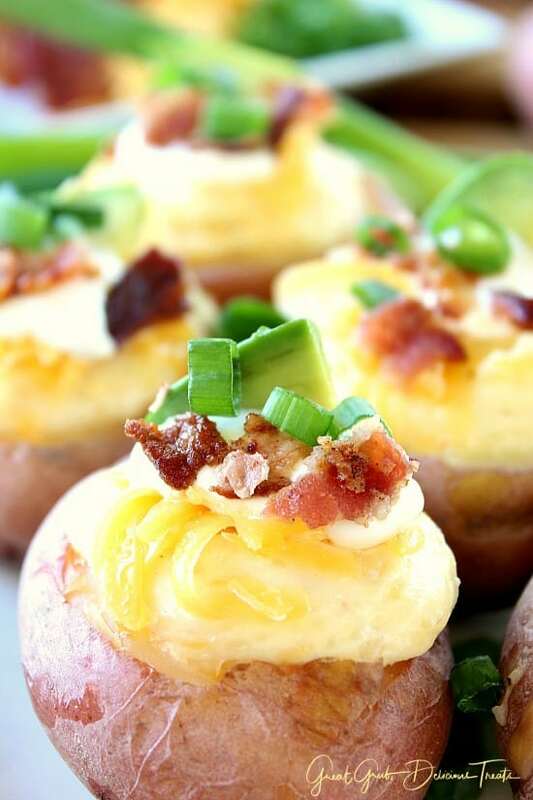 Baked potatoes are SO good and these twice baked red potato bites are even better. 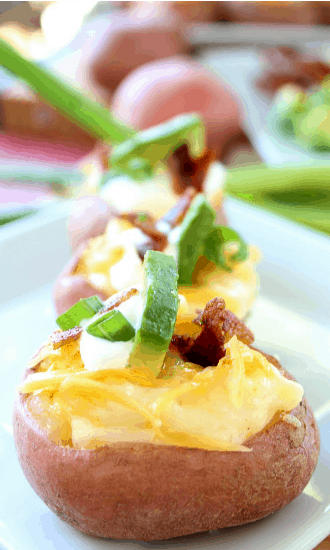 These little bite size goodies are loaded with crispy bacon, green onions, delicious cheese, and the creamy potato filling making these twice baked red potato bites super tasty and a great appetizer. 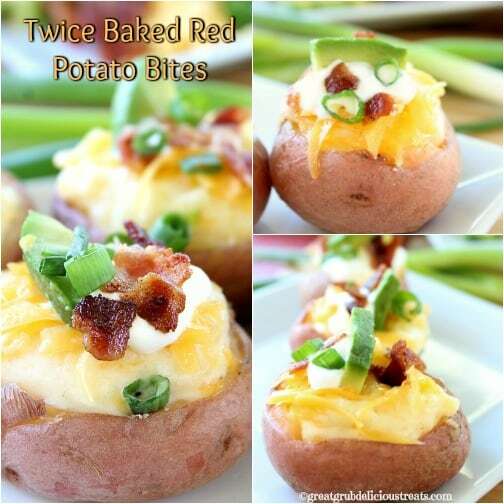 My favorite potato is the red potato especially when I make potato salad. 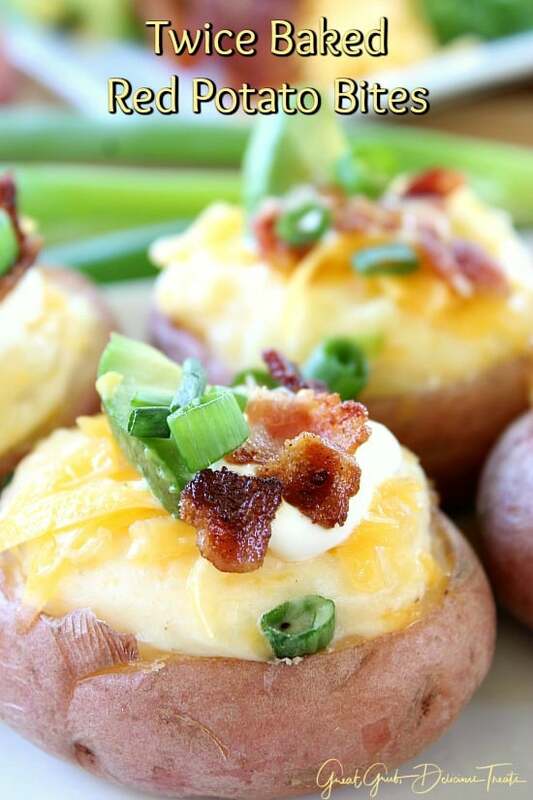 There’s just something special with these little tasty spuds. 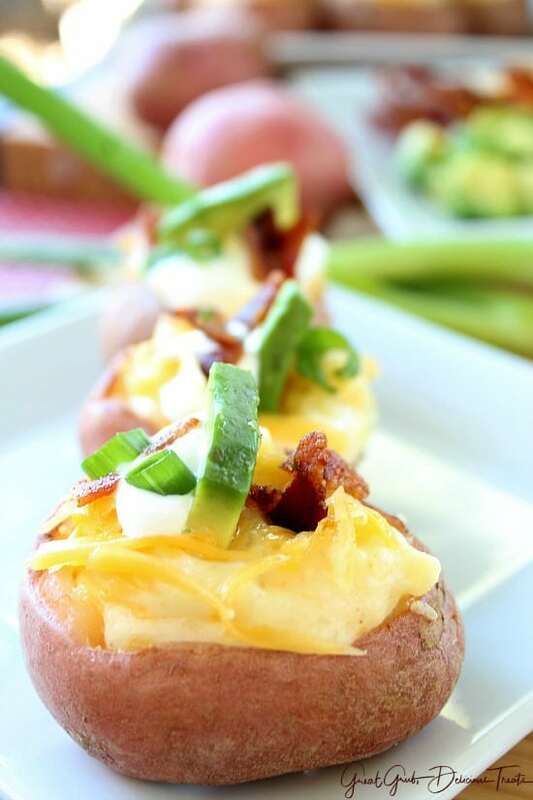 What I do to make these delicious twice baked red potato bites is poke each potato with a fork a few times, then I wrap them in foil and place on a baking sheet. Next, I bake these in the oven on 375° for about 25-35 minutes or until they are soft when forked. 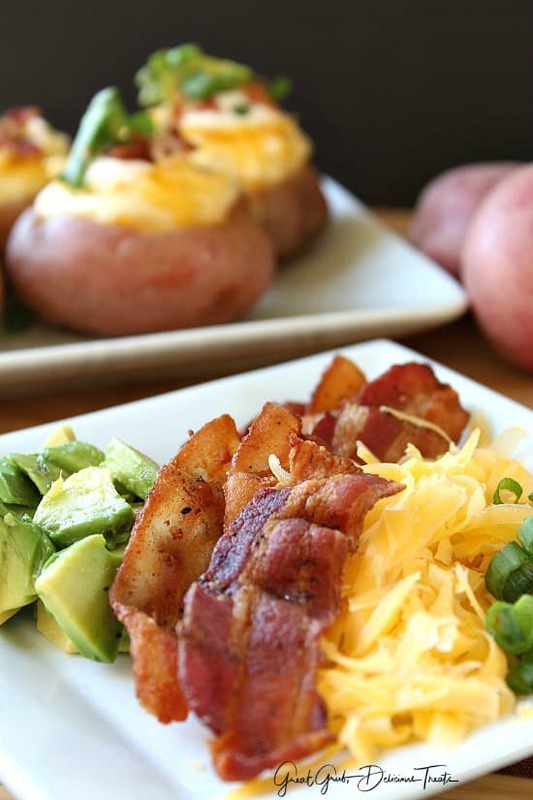 In the meantime while the potatoes are baking, fry up some delicious bacon, grate cheddar cheese, slice up some tasty green onions and right before serving, cut up the avocado for the final touch! After the potatoes are done baking, put the butter, cream cheese, and 1/4 cup of grated cheese into a medium mixing bowl. When the potatoes are cool enough to handle, remove the foil and slice off the top of each potato. Spoon out the insides, making sure to leave a little potato flesh, about an 8th inch thick, and place in the mixing bowl on top of the other ingredients. Once all the flesh has been scooped out of each potato and placed in the bowl, mix with an electric mixer, or a potato masher, adding milk as needed to get the desired consistency. Spoon potato mixture back into each potato and place back onto the baking sheet and bake for 10-15 additional minutes. 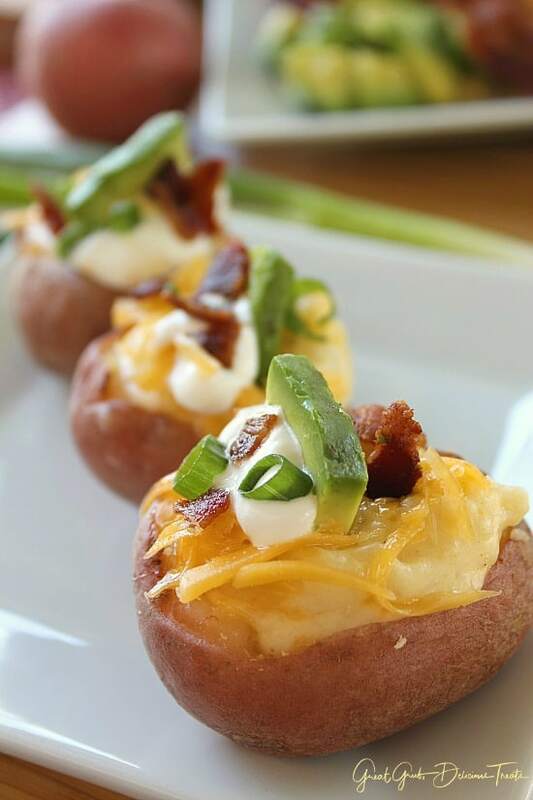 Remove from the oven, top with remaining cheese, a dab of sour cream, green onions, bacon crumbles and place a small wedge of avocado on each potato and enjoy! Poke each potato with a fork a few times and wrap in foil. Place on baking sheet and cook in the oven for 25-35 minutes or until soft when fork in inserted. Remove and let cool for a few minutes and then remove foil from each potato. In a medium mixing bowl, add butter, cream cheese and 1/4 cup cheese. 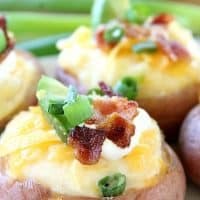 Slice the top off of the potatoes and spoon out the insides, placing in mixing bowl on top of butter, cream cheese, cheese, making sure to leave 1/8" along the edge of each potato. Once all potato flesh has been removed and placed into the bowl, mix with an electric mixer on medium speed or use a potato masher. Add milk to get desired consistency. Mixture with be thick. Spoon potato mixture back into each potato and place back on baking sheet. Cook for an additional 10-15 minutes, then remove from oven. 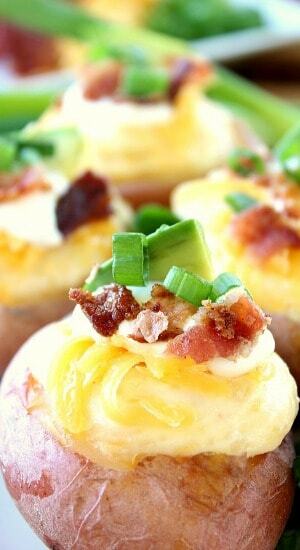 Top with additional cheese, green onions, small dab of sour cream, bacon crumbles and a small slice of avocado.